My Family Fun - A Whale of a Tale Dive into Math 1 Mathematics skills for kids age : 5 to 7 years! 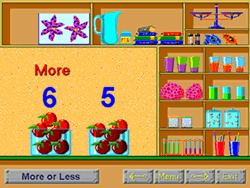 Mathematics skills for kids age : 5 to 7 years! The program is pedagogically sound with an expert in Primary curriculum development retained as the content consultant. The program is designed for children ages five through seven and can be used both in school and at home. The program comes complete with a Teacher's Guide and 32 blackline masters.